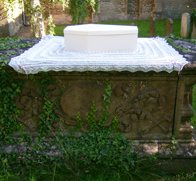 Lace folklore tells the tale of an unfortunate child who died as a result of suffocating under the vast quantity of lace that she was swathed in for her baptism. The story is based on the baptism, in 1778, of the infant Georgiana - daughter of the third Duke of Chandos. She was baptised by the Archbishop of Canterbury, who pronounced her to be the most docile baby he had ever baptised, her sponsors were no less than King George III and Queen Charlotte. According to the Annual Register of 1778 the Duke had spent ‘£3,000 on rich canopies, furnishings and brilliant illuminations at his London home. The christening clothes cost £700. Under the unaccustomed glare the babe took fright and was seized with convulsions and died the next day.’ The latter fact is confirmed in the Stowe catalogue of 1848. Although the base facts are verifiable it is impossible to say how or why the poor child actually died. At the time of Georgiana’s death the Burial in Wool Act was still in place, this inspired me to look at Shetland lace christening shawls. Whilst using traditional patterns I have chosen to work in slightly thicker wool and with a denser texture so that the shawl is less airy and has added extra layers of frills to represent the excess of lace that the child was wrapped in. I also looked into burial practices of the period. Recent archaeological investigations at Christ Church, Spitalfields have unearthed coffins from the 18th and 19th centuries. Many of the coffins still show external patterning of decorative nails, which were used to hold in place the fabric that covered the wooden coffin. Old funeral directors account books speak of ‘nail lace’ or ‘coffin lace’, which was originally, the term used for decorative strips of nails rather than, as it later became, lace used to line the inner edge of a coffin. Traditional bobbin lace is worked on prickings, which are made by punching a pattern of holes, with a needle or pin, into parchment or firm card. I have used this technique to mark out a lacy tracery of holes reminiscent of both prickings and the decorative pattern of nails on old coffins.